Borroloola is a remote Outback town with a rich heritage centred around mining, Aboriginal culture and the Gulf’s favourite past-time: fishing! Considered a lawless outpost when first gazetted as a township in 1885, Borroloola is almost as famous for it’s unique characters as it is for its fishing. 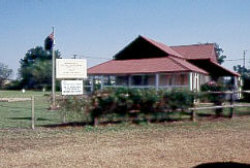 The Old Police Station was built in 1886 and its museum dedicates a display to the Police presence in Borroloola in those early days, as well as the Aboriginal and European history of the area. A key can be obtained from the nearby caravan park or the mechanic. Fishing is excellent in the Gulf country, with many Territorians travelling to the area to indulge the barramundi fishing. Borroloola is located on the McArthur River, approx. 60km upstream from the sea. Assorted styles of accommodation are available in town, including camping, caravan park and hotels.